I just upgraded one of my recent upgrades. The cord for the sewing machine foot control I have in the family room on the new little sewing cabinet had to run across the front of the cabinet down to the floor, and that interfered with the top two drawers in the cabinet. The cabinet had a mousehole to run a cord through in the back of the cabinet, but it wasn't big enough for the square plug on my machine. I made the mousehole bigger today so the foot control cord can run through the back like it should now. I'm so much happier due to a few minutes of work. We're working on a 10x5x3 three-tier rack to store some of the little bits of junk I salvage and use for various projects and repairs. I'm using four sets of legs from our old dock, and old lumber from stuff we've upgraded or replaced around here. Costs will be very low, but it will help me get the salvaged stuff organized and easier to use, plus define a space to help me curb my salvaging enthusiasm once I run out of room in the rack. That will be a huge upgrade. Not sure if we'll get it done yet this year because it's weather-dependent and it's been unseasonably cold and rainy so far this fall. But otherwise next spring it won't take long to finish. 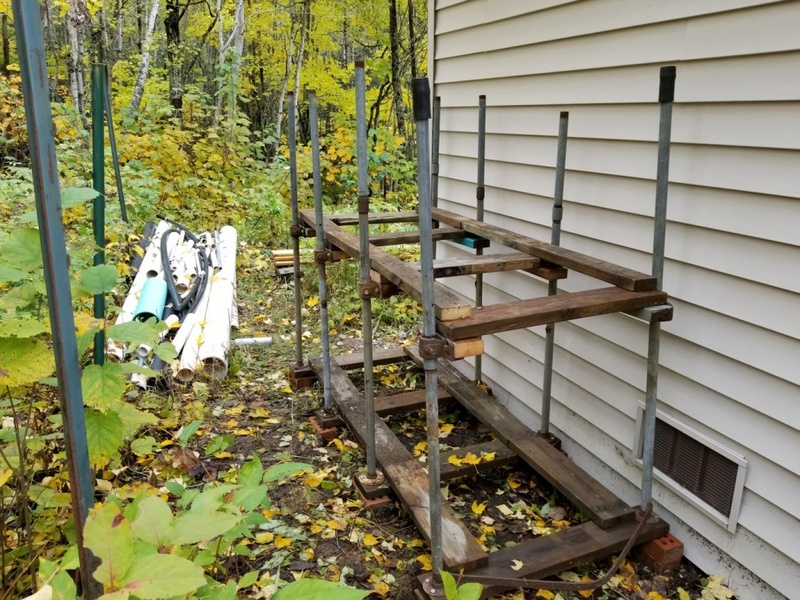 I am proud of the upgrade i got my youngest son and two of my neighbors just put a ramp on my porch it will help so much about getting groceries into house i have a high porch and i have a cart i can load things in and bring all in at once.My son paid for lumber $130. something. i will pay him back if he will take it labor free for they all help each other doing things.Good to have some neighbors that helps each others and others people of community. Fantastic! That should indeed be a big help! The 10 ft rack became a 6 ft rack due to the limits of the materials I had to work with, but I'm happy with it. It will hold a lot of stuff. I got an unexpected upgrade last night. 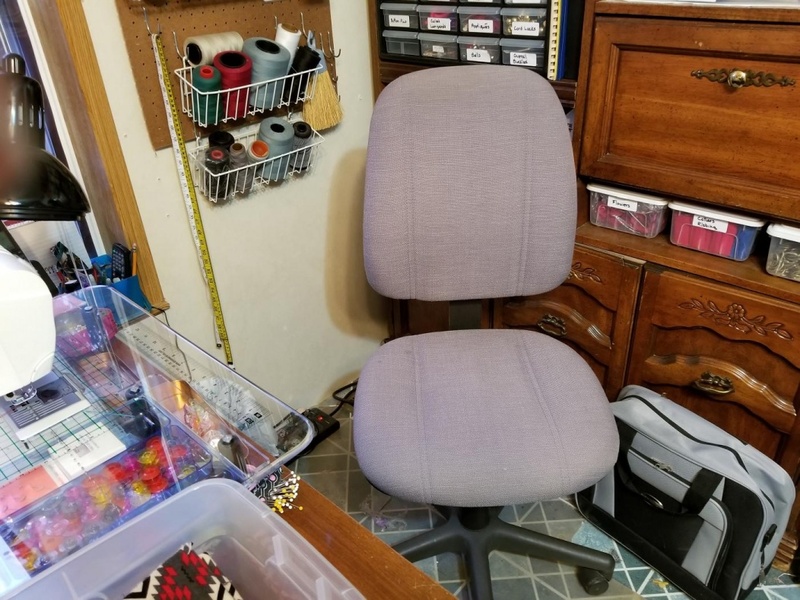 I had no plans to make a change to my sewing chairs, but Husby's work was throwing away a chair just like my favorite sewing chair, which I also got from his work years ago. He called to see if I wanted it yesterday. YES, PLEASE!  I could not pass it up! It's a great upgrade for free, and all it needed was a few squirts of lubricant on the wheels. Lucky me! These are ergonomic, commercial grade chairs and very solid and comfortable, and should last me the rest of my life. Nice chair and it should be easy to make slipcovers using elastic around the bottom. Yeah, I was thinking about slipcovers. I bought a bolt of tannish upholstery fabric at a garage sale for $1 a couple years ago. I have 4 office chairs in my sewing room and one by my sewing machine in the family room, and might have enough fabric for all of them. All of them would be fairly easy to slipcover, and the fabric is washable when it needs it. I doubt I will be changing chairs any time soon. All of them have to fit in specific places and each chair has been selected with that in mind, so unless something breaks, what I have is what I will most likely keep. It's taken me a long time to collect just the right furniture for my sewing spaces, and the whole system is getting close to perfect now.  I'm ridiculously excited about that. Thinking about trading in my 2007 Prius for a new one. I checked prices online last night and was surprised they are still very affordable, not much more than I paid 11 years ago. I spent $6K on repairs this year and you never know what next year will bring...... I also checked the likely trade-in value for the 2007 and that would help too, especially since I have maintained it well. Hope you can get the car you want, DLR. I realized today we need 2 more CO detectors, so will probably pick those up tomorrow. They will just plug into the wall, so easy installation. 12/2 Another up grade i am proud of my youngest ds and two of our neighbors put a ramp at my back door today it high off ground and the steps was from and old mobile home and not very steady and i was afraid to go in and out of it i will probably be paying for lumber but labor was free. Stove and fridge both giving us issues and has been for over a year. Going to deal until can't deal anymore. All the swagbucks and mypoints I do I'm saving for just that. Whichever goes first. They sure don't make them like they used to and I wouldn't have another LG shoved up my yahoo. He has a mower that he traded something for... a rider. It works/runs but guessing at some point it's going to go too. Washer and dryer are .. wow... 13 to 15 years old. So that's going to be a given. Lets not even talk about the vehicles. So as far as updating ... it's whatever whichever happens first. Edit to add... I would LOVE to have a full couch. It WILL fit in here but close. Right now all we have for sitting is a chair and a loveseat that's divided in the middle. So only 3 people can sit. Thank goodness it's next to the kitchen counter/bar type thing where there's 2 chairs. This living room is SMALL. Hubs You Tubed and fixed the fridge problem a few months ago. So far so good. Haven't replaced any of the other appliances however the hot water heater leaked in the utility room at some point and the stove/over an error light comes on sometimes and LG doesn't have repair parts for any over warranty age. Ran into that with them before. Spent probably ballpark $4000 on repairs on my vehicle and he's spent maybe $2000 on his. Mine has 201,000 miles and his 260,000 ??? ..
Basically in a nutshell everything is pretty much the same. DID buy a new porch chair as the old one broke. No more swivel ones. a ramp is important ! glad it was done for you. I agree Niko we have an LG fridge ..problems! and you can't go buy parts at the repair place for it either. Dh bought another CO detector for the new furnace. new kitten has chewed off part of the area rug edging. so looking at a new rug one day. minor things to go with the bigger ones. decluttering and rearranging to make things better.